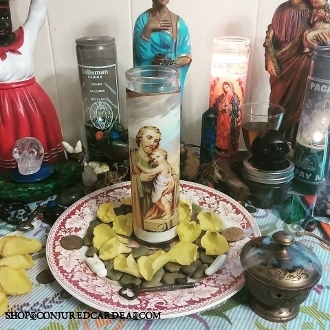 This listing is to reserve a candle for you on Saint Jospeh's holy day, March 19th. Saint Jospeh is hoored on this day around the world and especially in New Orleans where fava beans (also known as Saint Joseph beans) are cooked and served in his honor. A dish of dry beans is kept at the door to give to guests and small token bags containing a fava bean and a small piece of bread, to guard against hunger, are often given out to perishioners. This service is for those seeking employment, housing, and necessities such as food and money for bills for the home. It is also traditional to petition him on behalf of the displaced and those living in poverty. Saint Joseph is a wonderful Saint to work with to practice gratitude, if you are fortunate to have housing and food.